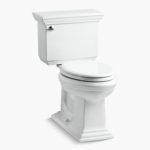 The Kohler K-3609 Cimarron Toilet is one of the company’s more popular models. With its sleek design, powerful flush and efficient water usage, you can see why it is highly rated. However is it the right toilet for your bathroom? Well, hopefully this Kohler Cimarron Toilet Review will answer the question. First of all, this is a two piece toilet. Two piece toilets are generally a little cheaper than their one piece counterparts, however they may need a little more cleaning. 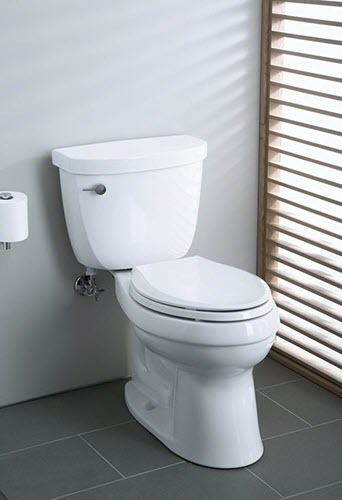 Two piece toilets have more crevices for dirt to grow, meaning a little more maintenance is necessary. Secondly, it has a comfort height seat. Unlike most most standard height toilets that measure roughly 14″ to 15″ from the floor to seat, a comfort height seat will measure 17″ to 19″. A comfort height seat is the equivalent of a chair height. This will make it easier for most adults to sit down and stand up, especially taller individuals. Not only that but a comfort height seat is a great choice for people that find sitting down and standing up difficult, for example the elderly, disabled, obese and those recovering from knee or hip surgery. It is worth noting that a comfort height toilet may make using the toilet a little more difficult for young children. The Comfort Height® feature provides chair-height seating that makes sitting down and standing up a lot easier for most adults. Thirdly, the toilet has an elongated bowl. For many people the choice between an elongated bowl and a round bowl is a personal preference. However comfort wise, there can be a difference. Generally, an elongated toilet bowl is 2 inches longer than a round bowl. This can be a little bit more comfortable for some people, especially for the larger individual. Also, an elongated bowl will take up a little more space compared to a round bowl, so take this into consideration if your bathroom is very small. Finally, the look of this toilet. My first impression of this toilet was that it is nice and neat looking. The tank is not very large, making it look quite short. It certainly is a nice looking toilet though and has a sleek design. It is also worth noting that the toilet seat is not included with this toilet. Probably the most important consideration when choosing a toilet is its flushing power and efficiency. It is quite easy to check how efficient a toilet is. Just check the gallons per flush (GPF) number to see how much water is used per flush. A WaterSense certified toilet needs to flush less than 1.6 GPF. This Cimarron toilet only uses 1.28 GPF which is a 20% water saving compared to a 1.6 GPF toilet. Now, 20% savings is excellent, however if you have a less modern toilet that uses around 3.5 GPF, then by upgrading to the Kohler Cimarron, you will really see the benefits. The Kohler Cimarron Toilet is WaterSense certified and meets water savings requirements for CALGreen and Colorado SB 14-103. Water rebates can be collected in certain states. So we can see that the Kohler Cimarron is water efficient, but how about its performance. Well, the Cimarron uses Aquapiston Technology, to deliver a powerful flush around the rim and bowl. The Cimarron features a canister flush valve with a flapperless design that is powerful and durable, giving a powerful flush every time. The Kohler Cimarron uses a DryLock Fast Install System which is design to prevent leaks and make installation as easy as possible. This installation system will definitely help people that want to install the toilet themselves. In fact, to connect the tank to the bowl, the only tool needed is a socket wrench (the demonstration in the video really shows how simple it is). To choose a worthy competitor for this Kohler Cimarron toilet, we have to find a toilet with similar features. 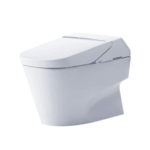 A two piece, elongated toilet, comfort height, WaterSense certified and of course highly rated. With all of these requirements considered, I chose the Toto Drake II. The Toto Drake II is another fine toilet that competes well with the Kohler Cimarron. First of all, they are both two piece toilets with an elongated bowl. Secondly, Toto’s equivalent of the Kohler comfort height measurements is its own Universal height measurements. A Toto Universal Height toilet has a measurement of 17 to 18″ from floor to seat. So both are well matched so far. Performance wise, both are WaterSense certified, however the Drake II is a little more water efficient than the Cimarron. The Drake II uses 1.0 GPF compared to the Cimarron’s 1.28 GPF. Both have a powerful flush that customer’s rate highly when it comes to a ‘One flush is all you need’ statement. The Drake II uses the Tornado Flush Technology compared to the Cimarron’s Aquapiston Technology. I have noticed that Toto boasts a CEFIONTECT glaze finish which prevents dirt particles from sticking to the bowl, where as Kohler does not advertise a similar feature. Both of these toilets do not come with a toilet seat, however the toilet seats that can be bought separately are both slow close. In my personal opinion, I found that the Kohler Cimarron’s design looked a little better to me. If you would like to see what the Drake II looks like, then have a look at a full review here. Finally, when it comes to price the Kohler Cimarron appears to be the winner. Although, the Toto Drake II may edge it in water efficiency, you will have to pay a little more for it. Overall, they are both great toilets with very similar features, performance and efficiency. If you were to choose either one of these highly rated toilets, I am sure you would have made a good choice. The Kohler Cimarron Toilet is a neat two piece toilet that combines performance, efficiency and comfort all in one. WaterSense certified at 1.28 GPF, using powerful Aquapiston technology and a comfort height seat, it is no wonder this toilet is so highly rated. The Kohler Cimarron toilet is a very popular toilet that is highly rated by customers and it is easy to see why. It boasts features such as comfort height seating, WaterSense certified efficiency of 1.28 GPF, a powerful flush using Aquapiston technology and easy installation. Does the Kohler Cimarron have all the features you are looking for? Let us know in the comment section below.